Know what I can do? I can knit with two colors while holding one color in one hand and the other color in the other. A few years ago, when I decided I wanted to learn to knit, using two colors like that seemed impossibly far out of reach. 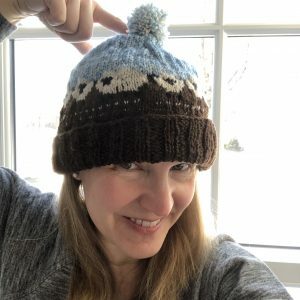 In particular, knitting this hat (which was super trendy at the time within the online knitting community) was something I would never be able to do. I’m accustomed to working to improve at the things that are already “my” things. Writing, certainly. Cooking. Drawing, even. Skiing. My sheep hat and I are here to defend looking like a rube. I see older kids aspiring to the level of cool in which you never, ever look like you don’t know what you’re doing. I have aspired to that myself, and often still do. I march confidently down unknown streets. I hang back to see how other people order a sandwich at the strange counter. I fake it until I make it or give up, and that is very sad, because I miss out on hearing directly how people do things and why, on learning to do things right, or sometimes on doing things at all. Changing that mindset involves giving up two stories we tell ourselves: first, that there’s no point in doing something unless we can do it very, very well, maybe make some money or at least impress our friends. Second, that there are lots of things you just can’t do unless you start young–which amounts to declaring that if you don’t already know how, you’re not allowed to play. But I want to do lots of things I didn’t learn at my mother’s knee. Knit. Grow a garden. Snowboard. Recognize animal tracks in the woods, make maple syrup, wear eyeliner, ride a horse. I don’t want to be limited by the fact that my ancestors failed to teach me how to tell a sugar maple from a red when the leaves are down. I want to be willing to ask dumb questions, screw up, burst into tears over my inability to ride my board across scary terrain and risk the scorn of everyone from the lady at the knitting shop who cannot fathom that I do not know how to wrap and turn to the cool kid on the lift who would never, ever accidentally get in the “single” line. Because I know, deep down, that there’s something that pro knitting lady and that cool kid would like to try, but can’t—because people who judge hate risking the judgement of others. I win! And I get an awesome hat. And, with any luck, I show my kids that there are worse things than tapping an oak tree your first time out. Like never making syrup at all.